The need to send variety tiffin snacks in school lunch boxes makes me go hunting for variety recipes. It kind of stresses me sometimes but then I take it as an opportunity to learn more recipes. 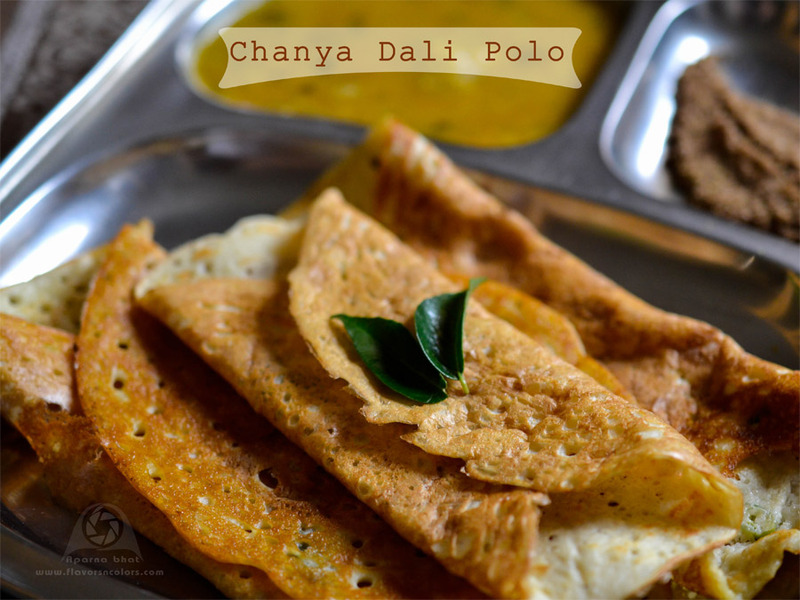 I have been trying out recipes for different dosa these days and today sharing the recipe of a variety dosa, Chanya dali Polo. This dosa is prepared from dals~ chana dal and urad dal only. It doesn't have rice in it so those who have diet restrictions or intentionally want to reduce their rice intake, this recipe is perfect and it can go on your list of meal options. Recipe below has been adapted from my cookbook based on Konkani cuisine authored by Sandhya Pai. Wash, rinse and soak both dals separately for 4 hours. Grind separately to a smooth paste, adding sufficient water. Mix them, add salt and keep the mix aside for 4-5 hrs. After the resting time, beat the batter well and add all the other ingredients. Heat the dosa griddle and pour a laddle full of batter. Prepare dosas by quickly spreading the batter [one ladle full per dosa] in circular motion, evenly and thinly. Dot with oil on sides while roasting. Cook on both sides. Serve them hot with sambhar and/or chutney. Note: You may add chopped onions and grated carrots to make it more nutritious. Entering this recipe for CC Challenge of the month April - Week 3. My legume love affair - MLLA 70 hosted by Avika, started by Susan and managed by Lisa. I can start my day with this channa dal dosa, no fermentation dosas are my favourite..Thanks for sending to Kid's delight.